It has been over fifty years since H. Richard Niebuhr published his Christ & Culture. Carson revisits Niebuhr’s original categories of Christians within culture and pronounces them lacking for today’s situation. 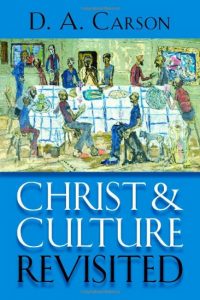 Niebuhr outlined six ways that Christians have looked at culture: Christ against culture; the Christ of culture; Christ above culture; Christ and culture in paradox; and Christ the transformer of culture. Carson sees useful attitudes in most of these but none which describes how Christians usually see culture today. Today Christians define culture as an environment which they have inherited and which usually cannot be much changed. The older conservative way of viewing culture was to see it as more equal to the “world” which was made by fallen men and opposes the purposes of God. Carson does a good job of bringing the conservative view into modern language, especially in challenging the contemporary view of culture being morally neutral. He also challenges today’s writers to present views that are more based on the whole tenor of Scripture, including past, present, and future perspectives of God’s purposes.